Reflections of a Newsosaur: How long can publishers afford to print? Unless advertising pulls out of its spectacular nosedive and rapidly begins to grow again, publishers may find within a matter of years that they cannot afford to keep printing newspapers. While there may be a sufficiently large audience of people interested in buying newspapers for a decade or longer (see prior post) , the high fixed costs associated with producing and delivering newspapers suggest that some publishers may not be able to sustain print products for as long as demand holds out. I arrived at this sobering conclusion by trying to project the profitability of print newspaper publishing for the next 15 years. The projections, which involved several moving parts, necessarily depended on a number of arbitrary assumptions, as detailed below. But the projections clearly indicate that publishers pursuing a business-as-usual approach to the newspaper business may find their print operations, in the worst case, to be unsustainably unprofitable within five years. Any number of factors, as we soon will see, could ameliorate or accelerate those outcomes. :: If you believe print advertising will stop falling and start growing as the economy recovers in the next few years, then you can make the case that print has a future for as far as the eye can see. :: If you believe the decline in advertising will taper off to a slow but steadily continuing rate of decay, then print has a few more good years before unavoidably high fixed costs consume what’s left of industry profits, thereby making the business economically unsustainable. :: If you believe the drop in advertising we have seen in the last four years will accelerate in the future, then stock up on newsprint as fast as you can, if you have fish to wrap or puppies to train. 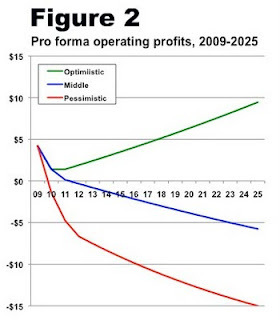 In an effort to illustrate how each of the above scenarios might play out, I built a model to gauge the future profitability of print in each of three cases through 2025. I used identical assumptions in every case, varying only how much advertising would rise or fall in each scenario. I started each case with these assumptions for 2009, the first year of the model: Advertising sales were $28 billion; publishers spent $16.8 billion (60% of revenues) on print production and distribution, and pre-tax profit was $4.2 billion (15% of revenues). Because production and distribution costs for the most part are fixed, I kept production costs constant in every year across all three cases. In reality, of course, production and distribution costs do vary from year to year, with costs falling if papers are leaner, fewer copies are sold and circulation declines. On the other hand, I made no effort adjust for inflation in payroll, benefits, paper, ink, fuel and other costs that are likely to increase over time. Further, I did not attempt to take into account the sort of savings publishers could achieve through such extraordinary measures as eliminating print editions on certain days of the week, shifting their revenue models to favor subscription fees instead of ad sales, outsourcing operations formerly handled in house or consolidating the production of multiple papers in the same plant. :: Optimistic Case – Ad sales drop 10% in 2010, are unchanged in 2011 and then grow at 2% a year in 2012 and each subsequent year. :: Middle Case – Ad sales fall 15% in 2011, slide 5% in 2012 and then decline 2% in 2012 and each subsequent year. 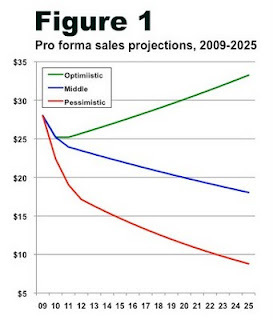 :: Pessimistic Case – Ad sales plunge 20% in 2010, drop 15% in 2011 and then decline 5% in 2012 and each subsequent year. The effect on advertising sales is shown below in Figure 1 and the impact on pre-tax profitability is shown in Figure 2. As you can see in the Optimistic Case, the newspaper industry pulls out of its advertising power dive in Figure 1 and returns to comfortable profitability in Figure 2. In the Middle and Pessimistic Cases, however, print profitability erodes in a matter of years. All other things being equal, print would be marginally unprofitable within five years in the Middle Case and profoundly unprofitable in a shorter time in the Pessimistic Case. But all other things aren’t likely to be equal. Apart from the few newspaper executives stubborn enough to hew to the industry’s traditional course in hopes of being rescued by a rapid and robust economic turnaround, it is reasonable to assume that most publishers are going to start doing something different in an attempt alter the deteriorating economics that are threatening their core business. I don’t know what the new innovations might be. The scary part is that I am afraid the publishers don’t, either. Good analysis. It gybes with my own personal thinking but not with what I am reading. The prevailing opinion in the industry seems to be that things will improve with the economy, or the optimistic scenario. I don't see that. I believe the ad industry has discovered it has greater impact on the Internet (and at much less cost) than it has enjoyed with print (both newspapers and magazines). I am waiting for the panic to break out when publishers realize what has happened, something you show should happen by 2013, or before. Seems the Detroit papers already figured this out. Publish 7 days, but home deliver 3. This is not news to the publishers. Like any business at this stage of its cycle, that is, the end, the publishers are harvesting the remaining profits until they fall below breakeven. Then they will shut down and sell the presses for scrap. They will slash variable costs until breakeven, that is, until they can no longer afford their capital fixed costs. Fellow journalists, (well, I left in '06), yes, that means more layoffs, more pay cuts and more of what you've been experiencing these past few years or so. Your piece gives the impression that the publishers may be cowering in the corners, biting their nails and fretting over what to do next. Nope: they're just looking at their annual returns and short term projections. I assure you they already know when the end will be. Case in point: the Atlanta Journal-Constition for the first time in 100-whatever years is leaving downtown Atlanta for the Dunwoody suburbs. I think they'll be setting up shop in a strip mall/office park, as they used to do for all their now-closed bureaus. This eliminates major variable costs of staying at their large downtown center. This move earned them some time but when the revenues don't improve -- as they surely won't, in a high-tech, professional city like Atlanta -- they will shut down that center and greatly diminish their footprint. When papers winnow themselves down to little dim red dwarfs, that's when the real competition will begin because the barriers to entry will have fallen significantly. That's when we'll see what the future of journalism is, when these hulking dinosaurs finally become fossils. Mostly over the past two years, Gannett has farmed out printing for more than half -- 53% -- of its more than 80 U.S. dailies. That work went to nearby presses at other Gannett sites and non-Gannett sites. Dozens of presses have been junked. Shouldn't the best idea be to improve content, charge a higher rate for home delivery for those willing to pay for the premium product while focusing on digital production (editorial and advertising) for mobile devices? It seems so simple to me, a recent j-school graduate employed at a newspaper. But in my experience with smaller newspapers (my parent company owns only small newspapers), the issue has been old management afraid to take on new ideas. I don't believe that printing costs are as fixed as you state. Newspapers have been making their web widths smaller and printing fewer pages. Since the bulk of their costs are paper, ink and manpower (they already own the presses), this will reduce costs as ad sales decrease. However, if ad sales continue on the path they are on, then, yes, there is no hope. Nice analysis, but don't publishers already know this? I believe the publisher of the Dallas Morning News said recently he thinks his paper has another 10 years of profitability left. He also told the Southern Newspaper's Publisher's Assoc. that in five years a newspaper won't own any presses or trucks, and it won't have substantial production capabilities. Am I missing something here or do these assumptions omit the possibility of readers actually paying more for the printed product? If "there may be a sufficiently large audience of people interested in buying newspapers for a decade or longer. . ." then they may be willing to pay to have such a product delivered to their doors. One thing is sure: Right now printed papers are an under priced true bargain. While we have already seen single copy and subscription prices going up, the question of how much a select group of readers is wiling to pay for a paper remains open. Lest we think the proposition of readers paying a lot more for their papers is a pipe dream, remember a cup of coffee that sells today for nearly $5 frothy with foam was not that long ago a humble cup of joe widely available for well under a buck. Most publishers are actively throwing costs overboard. Look at the LA Times: They've combined delivery with other newspapers, essentially walked away from some pretty good press units in Orange County and handed over their prime late press run in LA to the Wall Street Journal. That doesn't mean the revenue numbers play out any better, but the horizons get stretched out by reduced costs. The two killers: Strangling debt at many companies and the disappointing reality that online will not save the day. If the consumer has to pay more for home delivery what more will they get? Newspapers have, for the most part, stopped using kids on bikes who used to put the paper right on your doorstep and instead have hired independent contractors who throw the paper out their car windows, sometimes hitting your driveway, and sometimes killing the cat. What many newspaper pros hate to admit is that something better has arrived: the 24/7, 365 day news sources in the form of the Internet and cable news -- delivered via my phone, tablet/reader (soon), computer or TV. I personally don't believe the printed newspaper will go away . . . completely. But there will certainly be far less of them, and fewer launched because of the costs. But if the economy improves, and newspaper owners learn to market themselves again (big if) then there is no reason why certain big city papers might survive. But look for more Ann Arbor Chronicles, and less Detroit Daily Presses in the future. Seems to me that the key point was the last one made - that most newspaper publishers by now have figured this out and are working frantically to find ways to turn those lines around - probably with online solutions but not leaving out any possibility. Smart news companies and their executives know that it's a race against time. If they can figure out - either with one home run or more likely with lots and lots of singles - enough ways to make money selling news, they may be able to keep the doors open through the transition period. And in the process, they may be able to keep enough of the journalism infrastructure alive to keep the country from falling into information chaos. Trying to gauge whether advertisers will stick with print is easier than figuring out whether they'll stick with the current world of media companies. Print is dying. But "newspapers" don't have to die. It's an open question. I'm in the industry, and I don't know whether this is a great time for journalism, or a bad time. Change my mind every day. These are terrific articles, Alan. Newspapers vary on how important advertising is to them. Another is that companies every year do tend to get more efficient, as a rule about 2% a year. If you factor that in, your middle scenario is also stable. Furthermore, as newspapers close, the remaining newspapers lose competition. A two newspaper town becomes a one newspaper town. So advertisers go to the surviving newspaper and its rates may go up to. "News" and "paper" are headed for an inevitable split. At heart, publishers are organizations that own printing presses and want to make money with them. As news becomes a bigger and bigger loss, they'll turn to producing other products. If you're a journalist and you want to continue writing or photographing for a living get online now. Get a blog. Get comfortable with the medium. It will be your only home soon. The key to any of these newspapers continuing to exist is in having the best "unique selling proposition" for their advertisers and readers....so that BOTH will migrate towards them ----- they need to capture a bigger slice of whatever reader/advertiser "pie" exists in their market. Print will continue to be part of this...due to some of print's unique (tangibility!) attributes. BUT - the key will be the form in which they provide their "content" - advertising AND editorial. Platform development and VIDEO are key...especially in providing "added value" in selling advertisers. Publishers - disagree at your certain peril!!!! I've been thinking for a while that NYT and WSJ will become the dominant print/online news sources in major cities across the USA. Wash Post anyone? NYT and WSJ will increase local coverage just enough to win paying readers for print and online news, allocating their national and international reporting expenses across a much larger paying audience. The sheer number of current sources will not last. As a Chicago native I will be sorry to see the Trib and Sun-Times both gone, but the long-term economic viability of such big-city papers is scary. Same in Dallas, Philly, San Fran, Houston, Miami, etc. The news about Morris -- one of the top digital innovators in the legacy print field -- makes me wonder if your pessimistic case curve points downward steeply enough. Yes, they might have been over-leveraged. I don't have the numbers. But I think we'll see more bankruptcies this year -- particularly if the recovery is slow and bumpy. Want to start an office pool on how many? For Gardbergs: Clearly, the NYT and WSJ have national strategies, especially the NYT with the added local coverage in San Francisco and Chicago. But the WPO is in no shape to follow along. The decline in the newspaper over the last year is visible, with major errors and gaps in coverage. Politico is now the must-read paper for politics which should be the WPO's strength, and the paper runs yards of meaningless copy "On Faith" I guess on the grounds that Washington is a religious community. (It is, don't laugh.) It was beaten regularly on health care and the Leno-O'Brien dispute. As a 40-year reader, it is sad: but it is not the old WPO I once knew. mutter the operative word is snailpapers. print newspaper that will soon be dinoasaurs, but i use the term as a term of endearment, because i love my local snailpaper and will be sad when it stops. i dislike reading on screens which i do not call reading, i call it "screening".....good word? Just wanted to stop by to read your interesting entry. I was browsing the net for some info on this since I needed it for my report. Thanks for posting this. To reply to some of the commentors: I think that you've already seen the separation of news and print. AHN, Huffington, GlobalPost, annarbor.com and others are showing that you don't need a printing press to publish journalism. The only ones that I see crying that only newspapers can do journalism are those that own a printing press. Will newsprint go away? Nope! but it is no longer the mediuum of breaking news, others do that better, faster and cheaper. I think the smart phone/tablet growth is going to accelerate the decline in print advertising. People do not care about paper (for news anyway) they like papers because they are mobile. You can read it on the train in a coffee shop. The internet has already taken away a big share of the news attention, but was often limited by physical location and land lines. Mobile news could change all that. Bill and VD above, this is why i say we need to start calling our dearly beloved paper newspapers of the print kind as "snailpapers"....but in a loving way, because again, i love my local snailpaper and it will be a sad day when i have to "screen" my news-site on a damn screen. Yuck! I hate these screens! Great content, that is a compelling yarn with a beginning, middle and end, will sell to readers no matter what means is used to distribute the content. I agree with the comment that consumers perceive that Starbucks coffee tastes better and despair that newspapers and other local media are not investing more in making better papers that tell compelling stories. It's not about print versus online. It's about being interesting or should be.